Need Hospice Care In Your Area? Aberdeen Place Hospice provides in-home or in-facility hospice care in 23 counties in and around the metro Atlanta area. 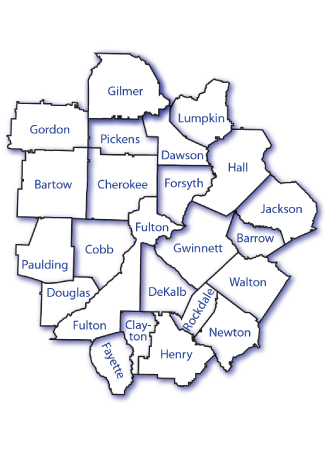 Click on the county below to see all the areas we service in each county. Not sure if we provide hospice care in your area? Don’t hesitate to give us a call. We are always expanding our hospice nursing care, support & counseling and medical assistance services to new metro Atlanta areas. Through responsiveness, comfort, empathy and delivery, Aberdeen Place Hospice will provide exceptional service to patients and their families ensuring their end-of-life journey is filled with compassion, comfort, respect and support. Our promise is expert care provided in a compassionate, caring, consistent and responsive manner in a private home or care facility. Aberdeen Place Hospice, Inc. does not discriminate based on race, color, national origin, gender or disability. Aberdeen Place Hospice serves eligible patients regardless of ability to pay.